Death Angel vocalist Mark Osegueda provided his pipes on AC/DC's "Riff Raff" and Metallica's "Metal Militia." Scar Symmetry guitarist Per Nilsson (left), Testament bassist Steve DiGiorgio and Anthrax drummer Charlie Benante play Ozzy Osbourne's "Flying High Again." The crowd inside the Alhambra Theater enjoys the 90-minute All-Star jam that featured many musicians coming together as a Dream Team of metal. Ward and Peterson play the Def Leppard classic "Wasted." Therion vocalist Linnea Vikstrom joins up with guitarists Rich Ward of Stuck Mojo and Eric Peterson of Testament to play "Wasted" off Def Leppard's "On Through the Night" debut album from 1980. Teaming up on AC/DC's "Riff Raff" were jam coordinator and Annihilator guitarist Jeff Waters (from left), Death Angel drummer Will Carroll, Serenity bassist Fabio D'Amore, Testament guitarist Alex Skolnick and Death Angel vocalist Mark Osegueda. Wussow of Xandria performed several songs during the jam. Xandria bassist Steven Wussow (left) and Amaranthe vocalist Elize Ryd were two of the musicians teaming up on Motorhead's "Killed by Death." Performing "The Trooper" by Iron Maiden were Anthrax bassist Frank Bello (left), Therion vocalist Thomas Vikstrom (center) and Grave Digger guitarist Axel Ritt. 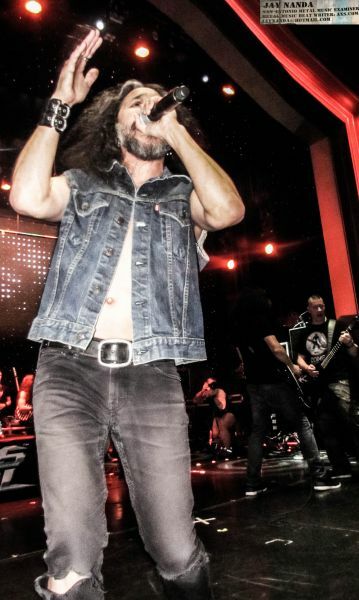 The All-Star Jam of the seventh annual 70000 Tons of Metal cruise Feb. 2-6 featured a who's-who of heavy metal collaborating on 12 classics, including Anthrax drummer Charlie Benante, Xandria bassist Steven Wussow (left) and Therion vocalist Linnea Vikstrom performing Dio's "Stand Up and Shout." Death Angel guitarist Ted Aguilar helps himself inside the media photographers' pit to take pictures of his vocalist Mark Osegueda singing AC/DC's "Riff Raff." Annihilator's Aaron Homma played bass and guitar on a few tracks. A young boy from Scotland, who also took part in the belly-flop contest, enjoys the All-Star jam from the front row. Elize Ryd of Swedish band Amaranthe sings Motorhead's "Killed by Death." Amaranthe vocalist Elize Ryd takes center stage on Black Sabbath's "War Pigs" with guitarists Alex Skolnick of Testament (right), Laura Christine of Zimmers Hole (back center) and Annihilator drummer Fabio Alessandrini. Scar Symmetry guitarist Per Nilsson rocks out on Ozzy Osbourne's "Flying High Again." The 12-song jam's only death-metal tune, Cannibal Corpse's "Hammer-Smashed Face," was performed by Dying Fetus vocalist John Gallagher (center), Testament drummer Gene Hoglan and Carcass guitarist Ben Ash. Annihilator guitarist Jeff Waters, who has organized the jam for all seven 70000 Tons cruises, busts out his Van Halen guitar for the event's opening song "Romeo Delight." Zimmers Hole guitarist Laura Christine, who is currently working on a new project with Testament drummer Gene Hoglan, teams with Touch The Sun bassist Russell Bergquist on Black Sabbath's "War Pigs." Wussow (from left), Benante, Linnea Vikstrom and Skolnick rock on "Stand Up and Shout" by Dio. Thousands of concertgoers, of any genre, could attend hundreds of shows in their lifetime and rarely witness on-stage collaborations of their favorite musicians. Even if they did, it might be for a song or two. Certainly not for an entire 90-minute concert of its own. But that's what happens every year on 70000 Tons of Metal. And this year's cruise laid claim to hosting the best All-Star Jam to date. Organized and emceed every year by Annihilator guitarist/singer Jeff Waters, who acknowledged the idea was formed over drinks in the karaoke lounge on the inaugural cruise in 2011, the Super Bowl Sunday exhibition in the spacious Alhambra Theater of Royal Caribbean's Independence of the Seas featured a who's-who of metal performing 12 mostly unpredictable classics that made everyone realize they were watching something unique. With last weekend's seventh annual voyage including a Big 4 band for the first time in Anthrax, and three of those members taking part in the jam, the bar was set high for future treks to top. Members of Testament, Overkill, Death Angel, Annihilator, Scar Symmetry, Therion, Stuck Mojo and others among the 61 bands on board joined forces to play songs ranging from Van Halen's "Romeo Delight" to Iron Maiden's "The Trooper" and Cannibal Corpse's "Hammer-Smashed Face." See the setlist and song roster breakdown below, including AXS footage of "Grinder" by Judas Priest and "I Wanna Be Somebody" from W.A.S.P. To watch finale "Metal Militia" by Metallica, click the video box at the bottom. 10. "I Wanna Be Somebody" by W.A.S.P.